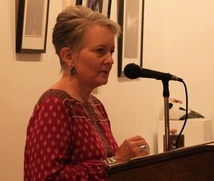 Jane Miller’s poetry has appeared in the Iron Horse Literary Review, Summerset Review, cahoodaloodaling, Mojave River Review, and Pittsburgh Poetry Review, among others. A nominee for Best New Poets and Best of the Net, she received a 2014 grant from the DE Division of the Arts and was a finalist in the 2017 Red Wheelbarrow Poetry Contest. Jane's poem, "Starving Time, Jamestown 1609," was published in A Plague of Shadows: A Written Remains Anthology.